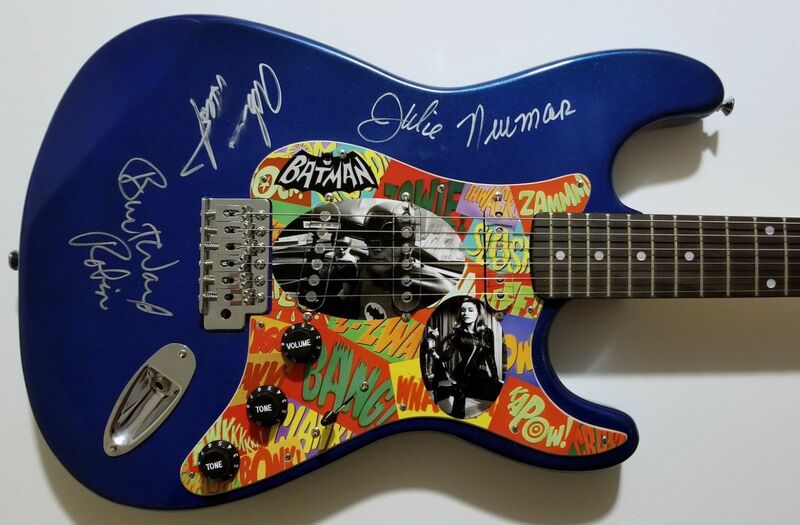 Metallic Blue 39 inch Electric Guitar signed directly on the body by Adam West, Burt Ward, and Julie Newmar as pictured above. The signatures are in silver metallic ink, so you do not have to worry about them fading over time! This awesome collectible features a beautiful custom Batman pickguard displaying vintage images of the three signers as Batman, Robin, and Catwoman against a collage of Batman fight words/sounds! Please note that while all three pick-up covers have an adhesive layer added on the top flat surfaces to complete the overall pickguard image without interruption, the middle and right pick-up image surfaces have the holes slightly miscut and therefore do not completely line up on the underlying top/bottom polepieces as seen in the last image. Also, Adam West brushed over his signature after signing it causing some light smudging as can be seen easiest also in the last image. 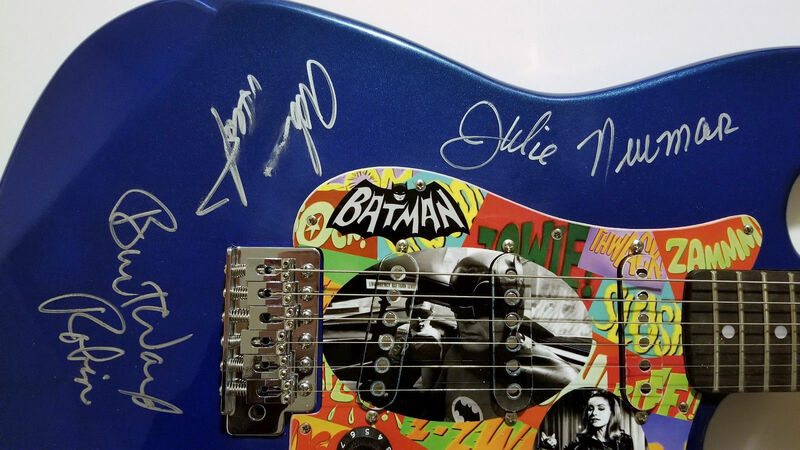 This signed guitar would look great in any collection or display ... or even make the perfect gift! The signatures were obtained on April 29, 2017 at the Hollywood Show held at the Westin Los Angeles Airport Hotel in Los Angeles, CA! !